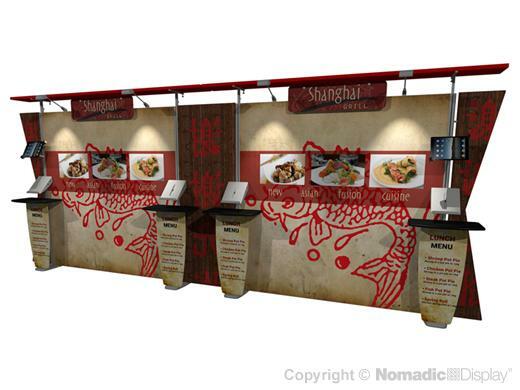 Inspire your audience to engage with your brand with an Inspire 2.0 fabric display. Inspire 2.0 fabric displays deliver an upscale aesthetic and versatile value. Now you can have a unique look from show to show or even day to day. Inspire’s canopy converts into four different shapes using the same canopy cover. Our most popular accessories easily mount directly to sturdy aluminum 56.5 extrusions. Mix and match or rearrange a wide variety of options like iPad stands, robust pedestals, brochure holders and more! Inspire 2.0 is a budget stretching solution because it’s scalable and expands or contracts to serve multiple venues. This 20’ Inspire 2.0 tension fabric display converts to two 10’ models. Made in the USA, our durable construction is backed by the industry’s best Lifetime Warranty.